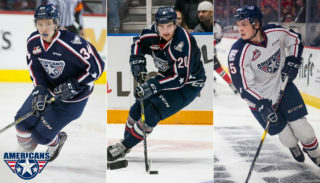 KENNEWICK, WA – It took four games, but fans of the Americans and Chiefs playoff series finally got the battle royal everyone had been expecting. 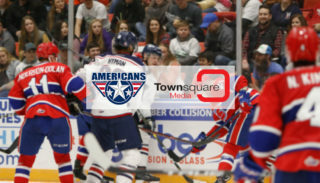 Drew Owsley recorded 47 saves on 50 shots and defenseman Tyler Schmidt netted the game-winner in double overtime, as the #3 Tri-City Americans (6-2-0, 12 pts) edged the visiting #2 Spokane Chiefs (6-1-2, 12 pts) 4-3 in front of 3,888 fans at the Toyota Center. With the win, Tri-City snapped their two-game losing streak to the Chiefs in addition to evening the best-of-seven series at 2 games apiece. Game 5 is set for Sunday night, April 17, in Kennewick before shifting back to Spokane for Game 6 on Tuesday. The Americans and Chiefs are no strangers when it comes to extra-session contests come playoff time. For Tri-City, 11 of their 37 total overtime playoff games have come vs. the Chiefs, more than any other opponent they’ve faced. And, it also marked the fifth time that a Tri-City/Spokane playoff game needed a second overtime to determine a winner. After being outshot 2-to-1 in Game 3, Tri-City came out looking to set the tone on Thursday. And, despite being outchanced 14 to 9 in the period, the Americans were assertive most of the period. 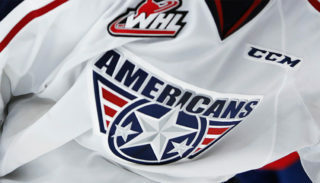 However, back-to-back Spokane power plays midway through the period eventually led to another 1-0 lead for the Chiefs. With 3:27 left in the first period, Steven Kuhn cleaned up a Dominik Uher rebound in the slot, collecting his fifth goal of the post-season and third of the series. Then, just 5:16 into the second period, and playing shorthanded, the Chiefs’ Jared Cowen broke out Tyler Johnson. Johnson carried the puck deep into the Tri-City zone before eventually deflecting a shot through the pads of Owsley for a 2-0 Spokane lead. Despite the two-goal deficit, the Americans roared back with a three-goal second period, starting with Patrick Holland’s power play marker. Just 33 seconds after Johnson’s shorthanded goal, Holland buried a cross-ice pass from Justin Feser, pulling Tri-City back to within one. Then, five minutes later, Carter Ashton fed a behind-the-back pass in the slot to Kruise Reddick, who then beat James Reid top shelf to tie the game at 2. Finally, with 3:28 left in the period, Brendan Shinnimin rifled a shot from the right circle, finding the back of the net above Reid’s blocker, giving the Americans a 3-2 lead. By the end of the first 40 minutes, Tri-City had also made up their first period shot differential, outshooting the Chiefs 24 to 23 headed into the second intermission. The Chiefs and Americans then combined for 28 shots on goal in the third period, keeping both Reid and Owsley plenty busy over the final minutes of regulation. It wasn’t until the 12:17 mark of the third period that Spokane knotted the game at 3. Johnson worked his way to the front of the net, connecting on a Cowen rebound for his second goal of the contest. But, it was all the squads could muster, as they headed to the locker room tied after regulation time. The first overtime was equally as exciting, with both clubs launching 12 shots on goal. But, even a late period penalty shot awarded to Brendan Shinnimin could not break the 3-all tie. Finally, on the first and only shot of the second overtime, Tri-City sent the hometown faithful home with a smile. Just 2:32 into the extra session, and following a Corbin Baldwin icing, Shinnimin was able to corral the loose puck in the right corner, before sending it back to the mid-point. From there, Schmidt just kept the puck in the zone, before firing a blast that beat Reid over his glove. 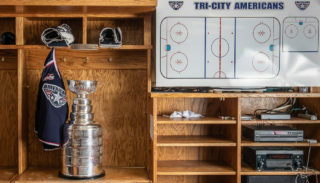 It was the first overtime playoff game-winner for Tri-City’s all-time defensive playoff scoring leader, ending the 7th-longest playoff game in Americans’ history. Owsley, behind his playoff-high 47 saves, also earned career win #18, supplanting Chet Pickard atop the all-time playoff wins list for an Americans’ netminder. Meanwhile, Reid finished with 46 saves on 50 shots in the tough-luck loss. Tri-City finished the night 1-for-5 on the power play, while Spokane went 2-for-5 on the man-advantage. Both teams will now get two days to recover before returning to the ice on Sunday, April 17 for a pivotal Game 5. Game time is 7:30 p.m. at the Toyota Center. Doors will open at 6:30 p.m. Tickets are available through all Ticketmaster outlets, including online at ticketmaster.com, the Toyota Center box office, or all Fred Meyer outlets. The game will also be broadcast live on NewsTalk 870 AM starting with the Sterling Savings Bank Warm-up Show at 7:15 p.m.